Everything is moving towards being automated including automobiles, industrial operations, and even your own home. To support this automation, a wide variety of sensors is required. The focus of this article will be on home and office applications that are required to know when a person enters, leaves, or is just present in a room or area. Occupancy sensing around the home or office offers many conveniences ranging from turning lighting on or off as people enter and leave an area, controlling the HVAC system based upon where people are present, and property security systems which can sense activity when there isn’t supposed to be any. Many systems that support these kinds of applications use passive infrared (PIR) sensors. PIR sensors have been commonly used in building automation and security systems for occupancy and object detection. They even work well when it comes to sensing motion of objects or people. However, more advanced detection applications have requirements that PIR sensors are unable to satisfy given their limitations. PIR sensors cannot detect motionless objects, direction of movement with any accuracy, or create thermal images. These tasks are all crucial in developing the next generation of smart automation and security systems. The ability to sense motionless people is essential for occupancy detection. When a person enters a room, the smart home or office system will sense them and automatically adjust the lighting and HVAC for that area to suit occupancy. If that person stays in one place for any length of time, the system needs to be able to sense that they are still there regardless of motion. Sensing direction of movement would enable an intelligent system to turns lights on and adjust HVAC parameters in rooms and areas that a person is moving towards before they actually enter them. The ability to create thermal images would help a system determine if the object detected was a person, animal, or something else altogether based upon predetermined patterns. This would allow a smart system to ignore pets or other animals when determining whether to adjust environmental parameters or if the object detected should be ignored in security applications. Simple PIR sensors are not capable of doing all of these things, but Panasonic’s Grid-EYE can (Figure 1). While most PIR sensors use only one thermal sensing element, the Grid-EYE uses an 8 x 8 array of 64 thermopiles that allow it to measure the actual temperature and the temperature gradients within a 60° viewing area. The Grid-EYE has an ASIC which converts all 64 thermopile signals to a digital format and references them to an ambient temperature provided by an internal thermistor before sending them out to a microprocessor. Once the microprocessor receives these signals, it can then perform calculations that will map the temperature data to a thermal image. Additionally, the Grid-EYE can detect the up, down, left, right, and diagonal movement of people or objects (Figure 2). Even multiple objects moving in different directions can be detected. This device is also capable of detecting close proximity hand movements, enabling simple gesture control. For typical home/office automation and security applications, several of these sensors would be required to cover the various rooms and/or entrances. Getting them all to interface to one main processing location efficiently could be a logistical problem. Fortunately, Maxim has a developed a solution with their MAXREFDES131# reference design board (Figure 3). Figure 3: Maxim’s MAXREFDES131# 1-wire Grid-EYE reference design board. This board incorporates Panasonic’s AMG8833 Grid-EYE and Maxim’s DS28E17 1-wire to I2C bridge into one reference design. With the DS28E17 I2C bridge, the MAXREFDES131# has the capability to communicate with the main processor up to 100 meters away through a single wire, compared to just a few meters for a typical I2C bus. 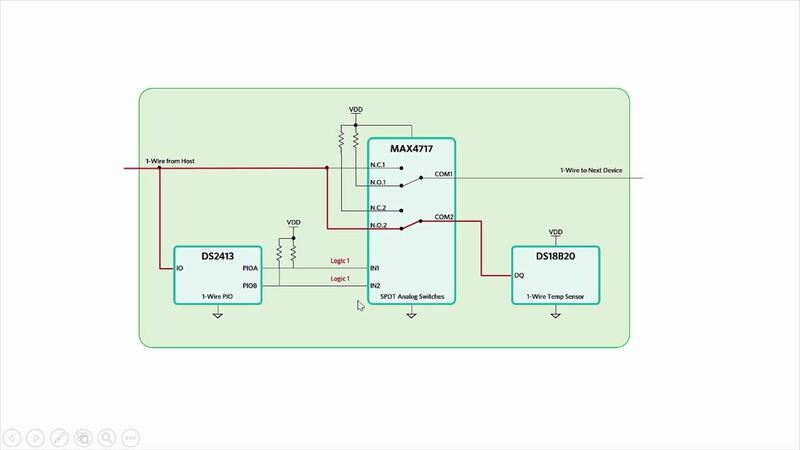 According to Maxim’s website, there is a demonstration GUI available that allows “for visual feedback of up to 10 daisy-chained MAXREFDES131# 1-Wire Grid-EYE sensors.” However, the 100-meter communication maximum range still applies no matter how many boards are connected together. This allows these devices to be placed in remote locations and still provide pertinent information to a single host processor via only one wire without requiring separate host processors, each with a set of to a few sensors, in several locations to interface with each other in order to cover the desired areas around the home or business. If more than one MAXREFDES131# is used in an application, the boards need to be individually identifiable by the processor to know the physical location that each one is monitoring. To that end, there is a DS2413 1-wire, dual channel, addressable switch that allows each unit to be individually enumerated included on the board (Figure 4). When the DS2413 receives its enumeration code, it will cause a MAX4717 dual-SPDT switch to connect to COM2 for communication with the DS28E17. When the board is not addressed, the MAX4717 is connected to COM1 to allow the host processor to communicate with other MAXREFDES131# boards that may be connected downstream. Disconnecting COM2 from the DS28E17 also causes it to go into sleep mode, disconnecting power from the AMG8833. When in sleep mode, the MAXREFDES131# will draw approximately 0.5 mA compared to about 8 mA when not in sleep mode. Maxim provides example code for both the mbed and Arduino platforms along with the demonstration GUI mentioned early on their website. With this code and GUI, developers can quickly set up their own network of MAXREFDES131# boards to evaluate and refine to fit into their applications. With the MAXREFDES131#, designers can develop the foundation for next generation occupancy and motion sensing applications for smart homes or offices and security systems. This reference design satisfies the advanced requirements of sensing motionless objects or people, determining direction of movement, and thermal image generation along with a simple, flexible means to communicate with a host processor – all in one unit. MAXREFDES130 and MAXREFDES131 Featuring the Grid-EYE Sensor Introducing the MAXREFDES131 1-wire sensing solution featuring the Panasonic Grid-EYE sensor and the MAXREFDES130 building automation platform. 1-Wire® Communications 1-Wire protocol is an efficient signaling scheme that multiplexes data and power onto a single bus, thereby minimizing interface complexity. DS28E17 1-Wire-to-I²C Master Bridge Maxim’s DS28E17 is a 1-wire slave to I²C master bridge device that interfaces directly to I²C slaves at standard (100 kHz max) or fast (400 kHz max). MAXREFDES130# Automation Shield Maxim's MAXREFDES130# works well with one or more of the MAXREFDES131#, the 1-Wire®, Grid EYE® sensor, to make a complete building automation solution. MAXREFDES131# 1-Wire® Panasonic Grid-EYE® Sensor The Maxim MAXREFDES131# 1-Wire® Grid-EYE® sensor reference design is compatible with ARM mbed and Arduino platforms for rapid development. Rich Miron, Sr. Technical Content Developer at Digi-Key Electronics, has been in the Technical Content group since 2007 with primary responsibility for writing and editing articles, blogs and Product Training Modules. Prior to Digi-Key, he tested and qualified instrumentation and control systems for nuclear submarines. Rich holds a degree in electrical and electronics engineering from North Dakota State University in Fargo, ND. 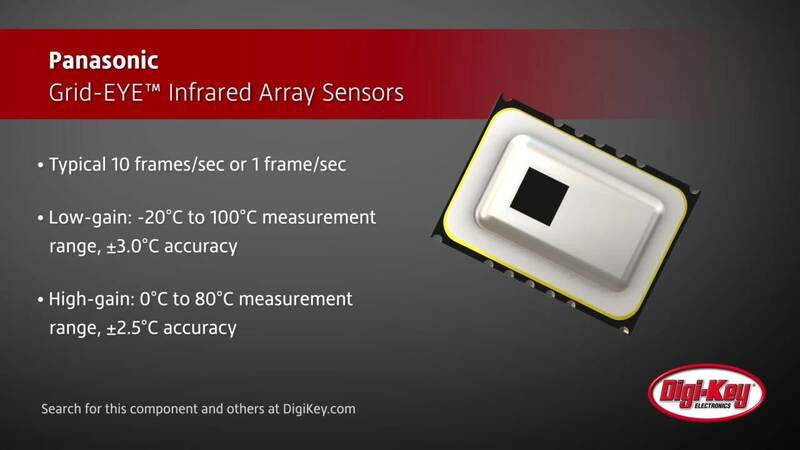 Digi-Key Electronics, based in Thief River Falls, Minn., is a global, full-service provider of both prototype/design and production quantities of electronic components, offering more than six million products from over 750 quality name-brand manufacturers at Digi-Key.